Anyone that knows me, knows that I’m a big fan of all things superhero. I’ve never been a comic person, but I love so many of the new films and TV shows that have been released in the last few years. The Marvel Cinematic Universe is what got me into it all, and has remained my favourite throughout - I especially love that it’s all connected, and get really excited when there’s new links to work out between things. 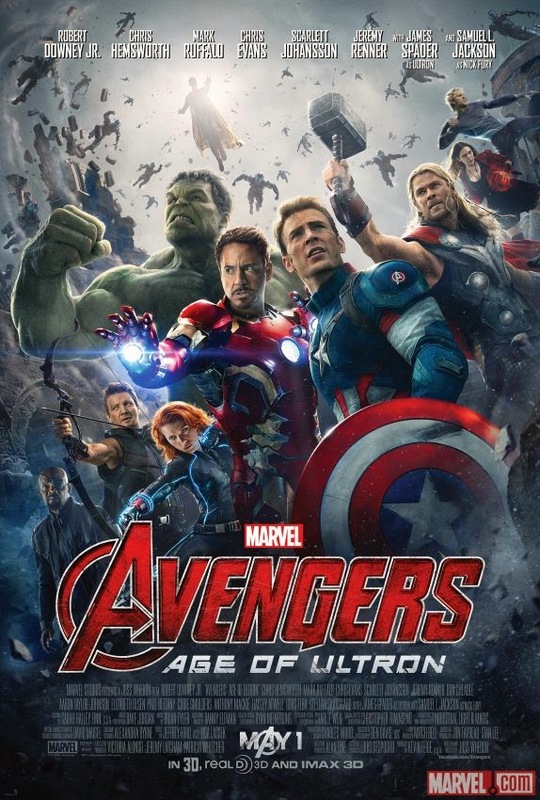 The first The Avengers film was particularly good, so of course, I was dying to see Avengers: Age of Ultron - and my word, it was fantastic. I know bits and pieces about the comic book history, from what I’ve found out online, so I do know where certain plot points within the MCU are heading already (the mid-credits scene you guys! ), but Ultron is one I’m less familiar with somehow. That did nothing to lessen my enjoyment though. Naturally, the action and special effects sequences were superb. Sometimes I can tire of endless fight scenes, but this film does a good job of making each one unique, and there’s plenty of super powers to keep things interesting of course. I think the Iron Man/Hulkbuster vs Hulk scene was one of my favourites. However, while there’s no doubt that this is a huge action-packed blockbuster, my favourite parts of this film are the moments in between. There are some stark reminders in this film that the Avengers themselves are not flawless - something that they become very aware of. There are moments of weakness and vulnerability that make them seem more like real, relatable people, and therefore make their successes all the more valuable. The film throws up some serious moral questions, about what the best way to save mankind really is, causing strife within the team, and making the audience question these heroes as well. It adds a very raw, human element to the plot. We also get a little more insight into the minds and backgrounds of some of the characters; particularly Hawkeye, who gets a bigger storyline than he’s had in previous films, and Black Widow, a fan favourite, whose background we finally get some glimpses of. With such a huge cast, not everyone can get loads of screen time, so it’s nice to see more for those who don’t have their own stand-alone films. The old cast shines, as always, and it’s nice to see clear evidence of their characters changing and developing, as each one faces their own inner turmoils, as well as the threat against the planet. I love all these characters, and it’s always great to see them come together like this, an d watch the dynamics between them all (Cap’s morality, Stark’s ego, Romanoff’s slickness, Banner’s fear). A few old familiar faces pop up too, if only briefly. I would have liked a bit more of Nick Fury though, as he was such a legendary and key player in previous films, that he felt a bit under-utilised this time. However, this instalment sees some new faces too; Quicksilver and Scarlet Witch make their debut, quite the formidable duo. We don’t get all the details about their past, but enough to give them context, and we see the struggles that they too are facing, giving them character depth beyond their powers. Their powers are especially fun though, providing the Avengers with new challenges, and Scarlet Witch’s mind manipulation proves to be particularly good at stirring up trouble. The Vision also appears, though he’s one I’m less convinced about - he made sense within the plot, but he’s something quite different to the rest of the time, and I’m not entirely sure he fits in just yet. I’ll see how things progress in future films though, as I’m sure we haven’t seen the last of him. Ultron, the villain himself, is outstanding though. Artificial intelligence is something that terrifies me, as this film shows just how dangerous it can be. Like the political turmoil in 'The Winter Soldier', the writers have presented audiences with a very real threat. With all the scientific advancements the world is making, surely A.I. isn’t impossible. It doesn’t seem all that crazy that someone out there could make the same mistake Tony Stark does. Ultron is both terrifying and charming though, with this scarily human personality. His thought processes and plan are fascinating to watch unfold, and his intelligence is astounding. He’s also hilarious though, perhaps having learned the same cutting sense of humour as his maker. The film is peppered with jokes, as is typical of MCU films, and I love this touch of fun amidst the film’s darker themes. All in all, I loved it. The MCU has done so well over the years, and I’m super excited about what’s coming next, but sometimes I worry that eventually they’ll make a film I don’t like as much. Fortunately, it wasn’t this one. They struck a great balance between high-impact action, and real human stories and emotions, between darkness and humour, vulnerability and strength. The film also left me with many questions about what will happen in future films (and TV), drawing me further into this fascinating universe. I’m definitely excited about Phase 3, and the new characters and stories to be explored (although I’m not sure I’m ready to say goodbye to some of the original ones just yet! ), so let’s hope these films continue to be just as outstanding. The Amazon links included are part of their affiliate programme, and I will receive commission on any purchases.